Research has shown that 87% of all training is forgotten within a month without reinforcement. In other words: No matter how brilliant your methodology, content or training, it's a huge challenge for clients to break free of old habits and adopt new behaviors. We understand your frustration when clients aren't able to successfully integrate your recommendations into their operations. We're here to help implement your expertise and ensure your hard work does not end up in a binder on the shelf. Effective implementation and accountability is essential for obtaining sustainable results. Traditional tools employed by sales organizations today simply weren't built to help drive accountability and successful behaviors. We’ve developed a vehicle for your expertise. One that makes the implementation of your sales methodology and strategy easier and more effective; a vehicle which empowers and guides your clients on the road to success, even when you’re not there. Membrain is the sales effectiveness platform that reinforces best-practice behaviours and drives accountability. It gives your clients intuitive tools that guide, visualize and optimize their sales effectiveness. With Membrain, your sales strategy comes to life. Together we will provide your clients with a road map to follow the path to sustainable sales excellence. 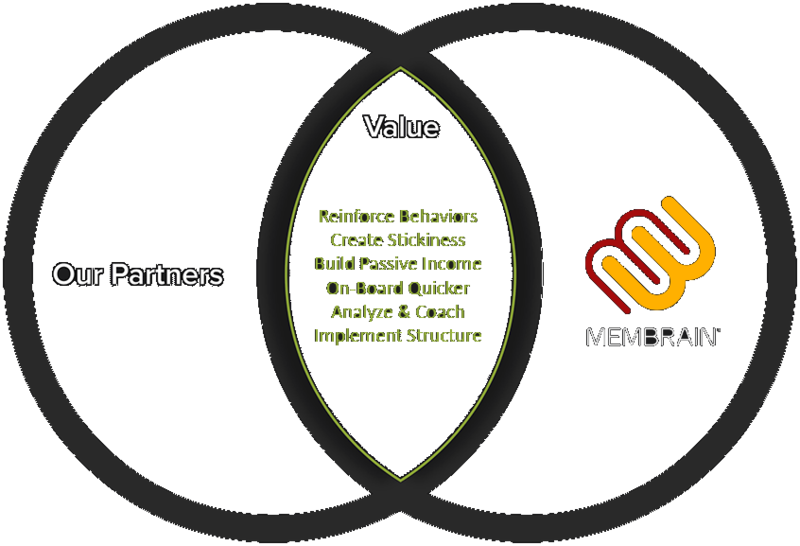 The true value for our mutual clients lies where your expertise, knowledge and services overlap with Membrains capability to operationalize that strategy and help reinforce winning sales behaviors. In addition to the benefits to your clients, you will also be able to generate passive recurring revenue, be able help more clients without compromising on the quality of your deliverables, gain greater insight into your clients and increase your "stickiness" with them by helping them become more effective and successful.